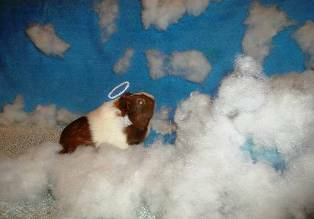 Once Upon A Time... there was a little Guinea Pig named Leela who wanted Angel Wings like the big Guinea Angels in Heaven. Leela pig often looked at the sky. She would wonder if she was accepted, and if she loved enough. In her dream, Leela went to Heaven. 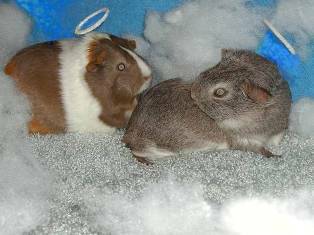 There she met an older Guinea pig named Emie. "What are you doing in my dream," she asked Emie? 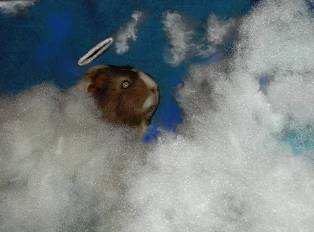 Emie pig answered, "I knew you were having this dream, so I came to tell you how Guinea Pigs earn their Angel Wings." "Is it hard?" asked Leela pig. "It can be," said Emie pig, "but not if you believe in yourself." "Believe in myself?" asked Leela pig, "but how?" Emie looked at Leela pig. She was very young, Emie thought, but, maybe she will understand. Leela pig looked at Emie. She knew this could be very hard. After all, was she a good little guinea pig? Emie pig seemed to think so. "Come follow me," said Emie pig with a wise smile, "and I will show you the way..."
Leela Pig set out to follow after Emie pig. But, Emie moved so fast! How could she keep up with Emie pig? Emie seemed to know the way, and moved up the mountain with great ease. She looked back at Leela pig and said, "Come on, you can do this, you must want to..."
Emie pig was so far ahead. 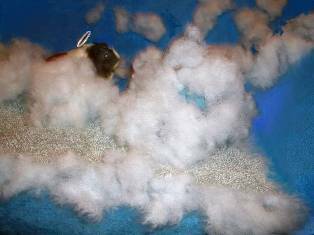 Little Leela pig thought she saw something on Emie in the clouds, or did she? She could barely see Emie pig. But Emie pig called out again, "Come on, believe..."
"Where did you go Emie"? Cried Leela pig. "I am not as strong or as wise as you. I do not seem to know my way." On the air waves she heard Emie pigs voice, "Oh, but you are as strong as me. in fact you are also right behind me." "I am?" asked Leela pig, "Why can't I see you then?" "But you can," said Emie, "I am right here!" Leela pig was worried. She could hear Emie, but where was she? If she tried harder, she just might see Emie pig. She must believe! So up the mountain Leela pig continued, on and on, as fast as her little legs could go. In the distance she could still hear Emie pig. "I'm here," Emie said, "believe..."
A fine mist seemed to come before her. It was very beautiful and smelled like roses! Is Emie pig in this mist? she thought to herself. The beautiful mist cleared at the top. 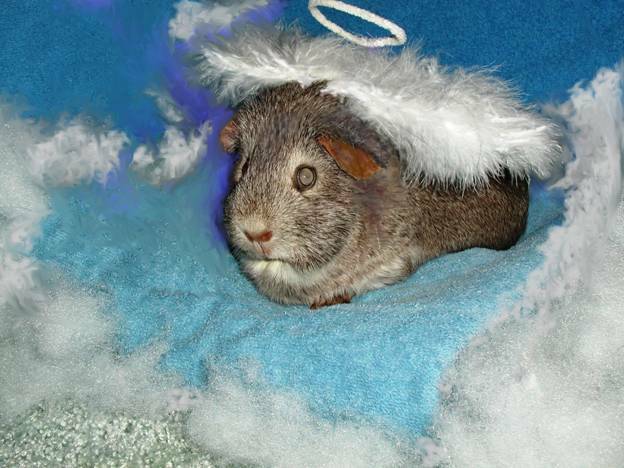 There was Emie, and she was a Guinea Angel! Emie Angel smiled. She looked at Leela pig with love and kindness. "I knew you would make it," Emie Angel said. "You just needed to believe you could do it. Your heart said you could!" "You know my heart!" How can this be" asked Leela pig? "Don't you know what an Angel is?" asked Emie Angel. "Please tell me" said Leela pig shyly. 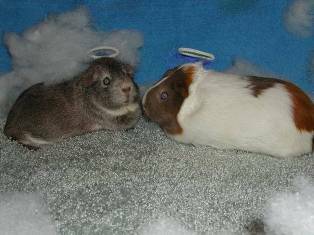 She did not want to offend the Guinea Angel! 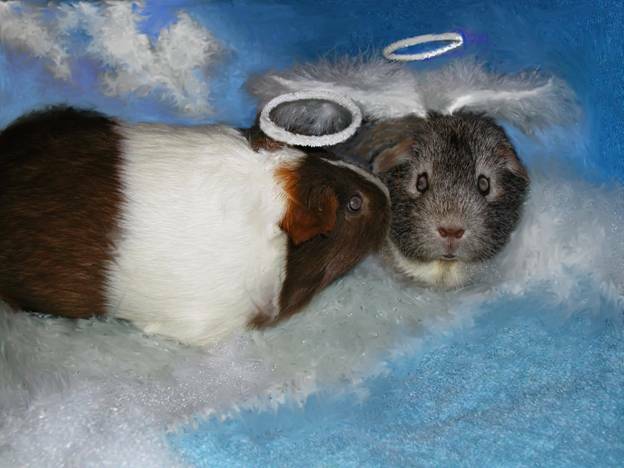 "A Guinea Angel watches over other little guinea pigs like yourself, and children too," replied Emie Angel. "You see, we all watch over each other. It is love that brings us together. It is love that grows our Wings." "Does everyone have wings?" asked Leela pig. 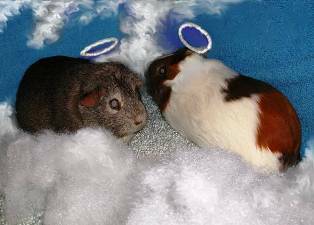 Emie Angel smiled at Leela pig, "Guinea pigs watch over children, and children take care of them. Because of this, great love goes out from guinea pigs for children and adults too! We get our wings by loving and being loved by them, and also by believing in ourselves." 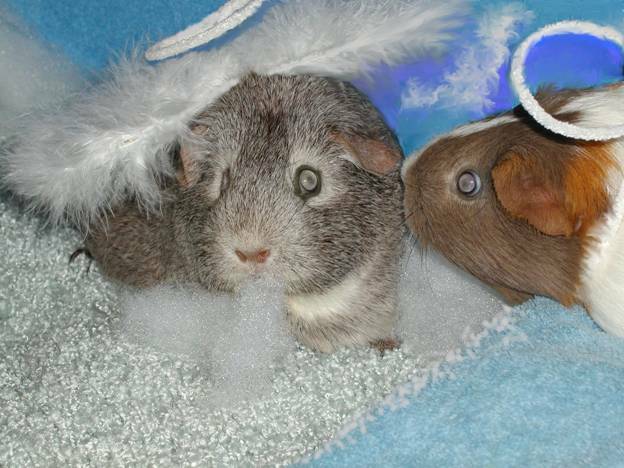 "The Great Guinea Angel knows your heart Leela," replied Emie Angel. "This Great Guinea Angel sees everything; sees your dreams, sees your love, sees the love you send out and the love that comes to you." "Oh," cried Leela pig, "Do you think I love enough? Do children and adults know we love them?" "Look down Leela," said Emie Angel. "See the people? See how they need love like us? See the need that you fill by your love for them and their love for you?" Leela looked down to earth. She never thought about the effect her love might really have. She did not realize all things need love, need care, and that the whole world was really about the lesson of love, giving love and receiving love. Now Leela understood what Emie meant in the beginning; she had to believe, she must. All she really had to do was to love and believe in the power of love! But, had she earned her wings? Was she good enough? "I have wings!" 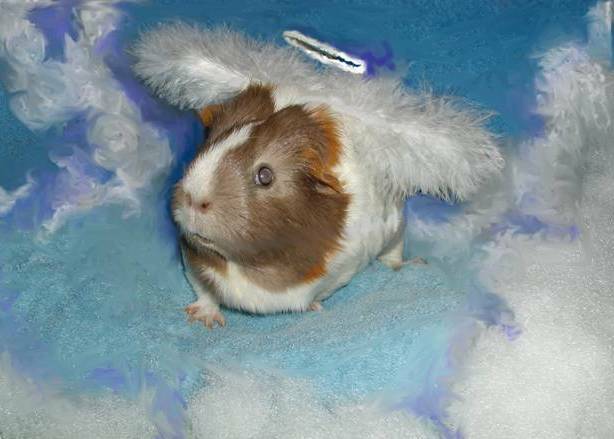 Leela cried, "I am a Guinea Angel!" "Yes," answered Emie Angel, "You were one all along. Only, you did not believe in your love, and see, now you do, for your Wings have appeared on you!" Later, early in the morning, Leela pig woke up from her dream. Was it real? she thought. Are we really Guinea Angels? She sat down and smelled the flowers in the air, and lo, for what was lying next to her? It was a white sparkling Angel feather. It smelled like roses. It smelled like love!! And may my love grow everyday. And may everyone and everything be Blessed!" You never know where you will find an Angel. You can be one by learning the lesson of love. Angels come in many forms. All you need to do is believe in love and in yourself. Then, like Leela, you too may see your own Angel, or better yet, feel your Angel Wings!